Are you a busy or new Guider looking for great ideas for fun, exciting and bold unit programming ideas? Have you ever found yourself running late and would benefit from an Instant Meeting or a Tool Box full of program resources? Does your unit desire something more Challenging? 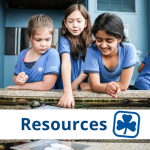 Fraser Skies Area has the resources you need for any girl branch, along with Newsletters full of a variety of program ideas, resources and other information. Running late? No time to plan? Here are some great instant meetings from the BC Program Committee. Just throw together a few supplies and you’re ready for a night of fun whatever branch you work with! Looking for some great program ideas? Check out the latest edition of the Fraser Skies Area Program Newsletter! Flags, Hats, Games and more! Area Center has a great supply of International items that can be borrowed for your meeting night. Challenges are a great way to complete program pieces, earn interest badges and challenge crests while having lots of fun with your Unit! STEM Challenge – A four-part challenge covering Science, Technology, Engineering and Math. Do you have a meeting planned where extra hands would be useful? Trefoil Guilds are willing to help out in units for specific projects if requested. Please contact the Trefoil adviser with your date, time and place, along with a contact email.Trefoil Guild members can help with: Sewing with Sewing Machines, Knitting, Craft Nights, Selling Cookies where help is required and so much more! Trefoil members miss the interaction with the younger members. Just Ask! Here A great resource awaits! Do you want to get your girls Outdoors? Check out the OAL Guide to Camping, it is a great resource along with many resources found in your MemberZone.